Every year, hundreds of asylum-seekers seeking help make their way to these quiet but crowded offices on the 19th floor of a Koreatown high-rise. They're here because they've suffered torture, at the hands of the governments of scores of countries around the world. 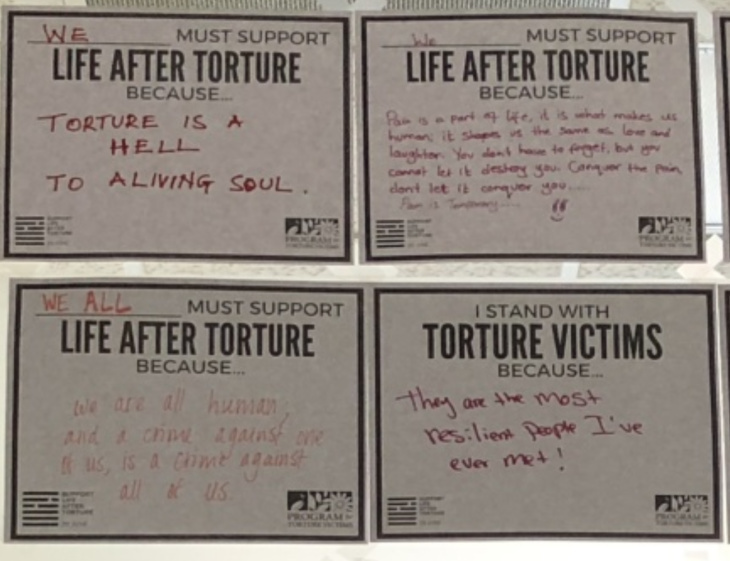 The Program for Torture Victims opened its doors four decades ago, the first of its kind in the United States. Today, there are about 60 such programs nationwide. The need is high. More than 4 in 10 refugees and asylum-seekers living in the U.S. experienced torture in their home countries, according to the U.S. Department of Health and Human Services. The U.S. has welcomed more than 3.5 million refugees since Program for Torture Victims began. In 2016, the U.S. admitted nearly 85,000 refugees and granted asylum to about 20,000 people. Coming to America can be a very disorienting journey. "It's almost like a Star Trek episode," said clinical director Carol Gomez. "You kind of beam yourself over to another country and all of the molecules settle, but then you're in another country and you're like what the heck, I don't even know how this place works." Still, Gomez said, most clients arrive with optimism that America will be a "land of the free" that respects their human rights. "The reality, if they've come in more recent times, has certainly been a lot more shocking. Many people find themselves detained for weeks or months in shackles and orange jumpsuits." As the number of refugees who need help around the world grows, the Trump Administration reduced the maximum number of refugees the U.S. will accept this year from 45,000 to 30,000. That's the lowest level since the refugee resettlement program was launched in 1980. In December, President Trump announced a plan to deter asylum-seekers at the Southern border, requiring them to wait in Mexico, instead of the U.S., while their claims are processed. The policy, which took effect last month, is expected to face legal challenges for migrant rights groups. 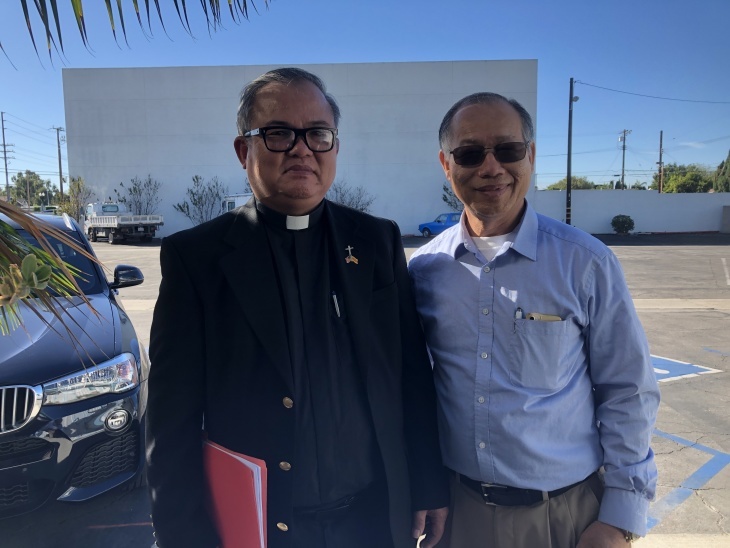 Gomez estimates that eight percent of the program's clients fled religious persecution in their homelands — like exiled Vietnamese evangelical Nguyen Cong Chinh, who still has a scar on his head from one of many beatings by Vietnamese authorities. "Between 1990 and 2011, I was interrogated more than 400 times. And each time that I was interrogated, I was also tortured," Chinh said. Chinh is an evangelical pastor who sought refuge in Southern California in 2017. "I picked Santa Ana because this is the capital of free Vietnamese," said Chinh. "I wanted to come here because of the community here. But I also wanted to settle down and seek treatment for whatever condition I had." Chih said he was tortured for preaching to and advocating for protestant ethnic groups not approved by the communist government — like the Montagnards in the Central Highlands. "They started to attack the local congregations that have anything to do with me," Chinh said. "Some of the pastors and congregation members were tortured and killed." In 2011, Vietnam charged Chinh with "undermining national unity" and sentenced him to 11 years in prison, where he spent time in solitary confinement, and was fed shards of glass. He says his family continued to be targeted. Behind bars, Chinh organized hunger strikes with other prisoners of conscience over their mistreatment. Then, halfway through his sentence, Chinh was released, on the condition that he leave Vietnam with his family right away. "These psychological traumas that my wife and child went through, we still carry those, even though we are in America now," Chinh said. More than 40 percent of those granted affirmative asylum in the U.S. in 2016 — about 12,000 people in all — are living in California. Those waiting to be granted asylum can't get work authorization to bring home a paycheck. The transition can be especially difficult for victims of torture. According to clinic officials, nearly 30 percent of L.A. clients are gay, lesbian, bisexual or transgender. Many are Central Americans fleeing violence. Most connect to the program through word of mouth within L.A.'s many ethnic enclaves. "The trend of people coming in through California doesn't necessarily reflect the trend of what global geopolitical conditions are," Gomez said. "Most of the people come here because of some remote tie to that same national community, be it a Church, a pastor from that country, distant family relatives, or whatever." says most of the hundreds who walk through their doors each year suffer from post-traumatic stress. "If you've had to leave your country because you're fighting for human rights, sexual rights, religious rights, or tribal rights, those things are extremely traumatic," DuRocher said. "They've lost so much, and if we don't have a program to help them, they go on with depression," she said. "They flounder around for a long time. They need something to get on their feet again." But resources to provide help are limited. 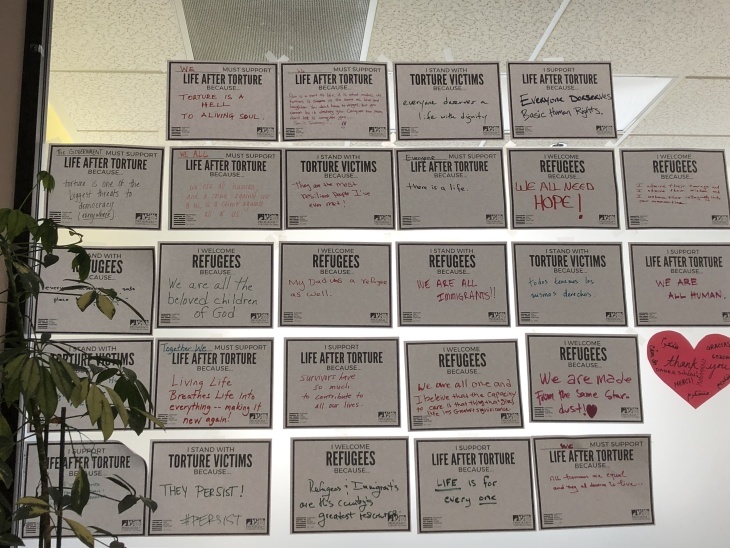 Funding from the federal Office of Refugee Resettlement, lets L.A.'s Program for Torture Victims treat asylum-seekers from more than 65 countries each year, Still, it can only serve about 300 people annually. That's just a drop in the bucket of more than a million refugee and asylum-seeker survivors of torture living across the country. "Today, I saw a young woman from Uganda who suffered from FGM [female genital mutilation], and then I had another client who's lesbian from Armenia, another one from Russia who suffered persecution because they're protesting against the government," DuRocher said during a December visit. Her office provides medical care, case management, trauma therapy and, most crucially: forensic evaluations. Ninety percent of asylum-seekers who get these exams are granted asylum, compared to 43 percent overall. "If they've had a psychological assessment, it is a big support to their case," DuRocher said. Gomez says all clients have at least one thing in common: they've suffered tremendous loss. "Some have literally lost children or family members or spouses or partners to persecution, to violence," Gomez said. "Almost all have fled hoping they can find a safe place to live and then bring other members of their family who are suffering trauma to safety."